Randi Hobbs is one of 10 dentists participating in a state program that provides cash incentives for dentists to practice in underserved rural areas. She practices in Sulphur. 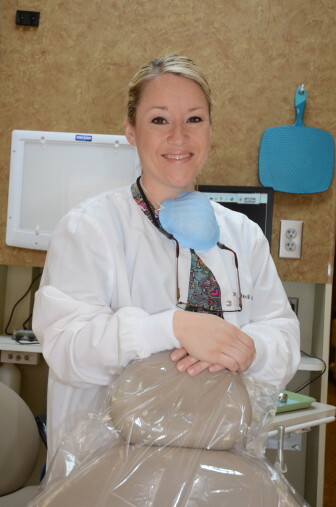 Removing teeth is routine for dentist Randi Hobbs. At least once a month, she removes a full set of decayed teeth and replaces them with dentures. Hobbs works at Arbuckle Dental in Sulphur, where many patients come in with long-neglected teeth and severe pain. Some have come straight from the emergency room. Many are in need of teeth extraction because they “wait until it gets bad,” Hobbs said. • Oklahoma ranked last among all states and the District of Columbia in 2010 in percentage of adults who visited a dentist or a dental clinic in the previous year. About six in 10 Oklahoma adults went to the dentist. • The state ranked sixth worst in percentage of adults aged 65 and older whose natural teeth had been extracted. The share was 25 percent. • About six in 10 third-grade students in school year 2009-2010 had tooth decay, or cavities. Close to a fourth of third graders had untreated cavities. The reasons for Oklahoma’s poor dental health are tied to some of the same reasons cited for its poor overall health. 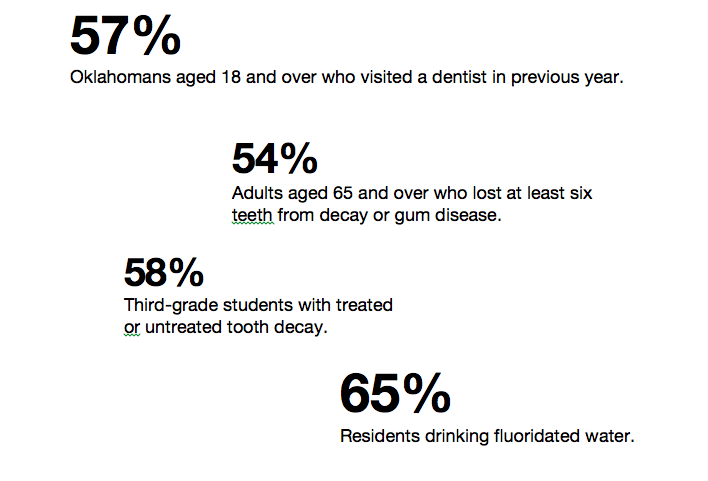 But with dental care, some of the key numbers are more extreme. One example is lack of insurance. About 17 percent of Oklahomans have no health insurance, but a much larger share of residents, about 50 percent, don’t have dental insurance, according to an Oklahoma State Department of Health official. Jana Winfree, chief of dental health services at the health department, said many jobs don’t come with dental insurance and many workers can’t afford to pay out-of-pocket for dental work. Simple procedures can cost hundreds of dollars. Winfree also said SoonerCare, which is Oklahoma’s Medicaid program, provides limited dental coverage to adults. The program covers teeth cleaning, full exams and fillings for pregnant women. Otherwise, for adults, it only pays for emergency teeth extractions. The federal Affordable Care Act will require pediatric dental benefits to be offered in individual and small-group plans in and outside the state’s new health-care exchange, where people can shop online for insurance. But the requirement doesn’t include benefits for adults, although dental plans will be available. How affordable the plans will be is still unclear. Another reason for poor dental health in Oklahoma is a shortage of dentists. The state is home to about 2,000 dentists, but most are located in urban areas such as Oklahoma City and Tulsa, creating dental deserts elsewhere. This year the state designated 56 counties as dental health shortage areas; four of the counties don’t have any dentists. Winfree said addressing the issues is important because oral care is vital to maintaining overall health. “It just makes you a healthier person because you have a better quality of life,” she said. Despite the problem, the dental health services’ budget has dropped by nearly 30 percent over the past three years, to $1.2 million. Winfree’s division is using various strategies to address the problems. One of the most critical is fluoridation of water, considered crucial in preventing tooth decay. Among the state’s 1,095 community water systems, two-thirds are not fluoridated, according to a 2012 Oklahoma Community Water Fluoridation Plan. Only 53 systems add fluoride to improve health benefits. More than 300 others buy fluoridated water from other systems or use naturally fluoridated water, the plan said. About 65 percent of Oklahomans receive water from a fluoridated supply, according to a CDC survey. That compares to 74 percent nationally. Is Your Water Fluoridated? Find out at this site if fluoride is added to your public drinking water and what the fluoride levels are. Select Oklahoma, a county and a water system. The latest data is from 2008, but policies on whether to add fluoride likely haven’t changed for most systems. “Our department is trying to provide water fluoridation because cities are usually stopping the practice for mechanical or cost reasons,” Winfree said. Shawnee, McAlester and Okmulgee are among cities that have stopped fluoridation. To combat the trend, the state has stepped up efforts to promote the benefits of fluoridated water and is monitoring fluoride levels. “Science supports that fluoridation is beneficial, cost-effective and safe to all those who drink fluoridated water,” Oklahoma’s fluoridation plan says. The first community in Oklahoma to add fluoride was Nowata, in 1951. But several years ago, Nowata stopped fluoridation. Chuck Rowland, superintendent of the system, which serves 4,000 people in the area, said many small communities can’t afford to fluoridate because of the cost of feeder systems. He thinks fluoridation is often overkill because of naturally occurring fluoride and the widespread use of fluoride in toothpaste. “They just can’t afford it,” he said of smaller towns. Another state program offers an incentive to new dentists to practice in rural areas. The Oklahoma Dental Loan Repayment Program, which began in 2007, offers $25,000 a year for two to five years to new dental-school graduates who agree to work at health clinics in underserved rural areas. At least 30 percent of the dentist’s services must be for Medicaid patients. Fifteen dentists, including Hobbs in Sulphur, are participating. The state Legislature passed a bill this year that expands funding for the program, allowing Winfree’s division to increase participants to 25. The state also funds dental clinics offering free care primarily to uninsured children and pregnant women. The clinics are in eight county health departments and are open from two to eight days a month. In addition, the state sponsors an annual event called Oklahoma Mission of Mercy, in which volunteer dentists and others give free care to those who don’t have dental insurance. At the Lawton event in February, volunteers treated almost 1,800 patients, many of whom waited in line from eight to 12 hours. The location for Oklahoma Mission of Mercy changes annually, with next year’s scheduled in Enid. Winfree’s division collaborates with other groups such as the Oklahoma Dental Association, the Oklahoma Health Care Authority, the Oklahoma Dental Foundation and the Children’s Oral Health Coalition. “If we can get some headway with education, fluoride and sealants on children’s teeth, then I think it would reduce the amount of tooth decay we see in our adults,” Winfree said.